You are here: Home / Dogs / Will She Be Able To See Again? The quick answer to that question is: Yes! I took our new arrival, blind Millie, to see our veterinary ophthalmologist, Dr. Sarah Hoy, in Burlington last week. As soon as Sarah shined a light into Millie’s eye and I saw her pupil contract, my heart skipped a beat. I knew that meant her retina was still at least partially working, even behind the thick, cataract lens that was detached in her eyeball. But more tests needed to be done to confirm that initial finding. 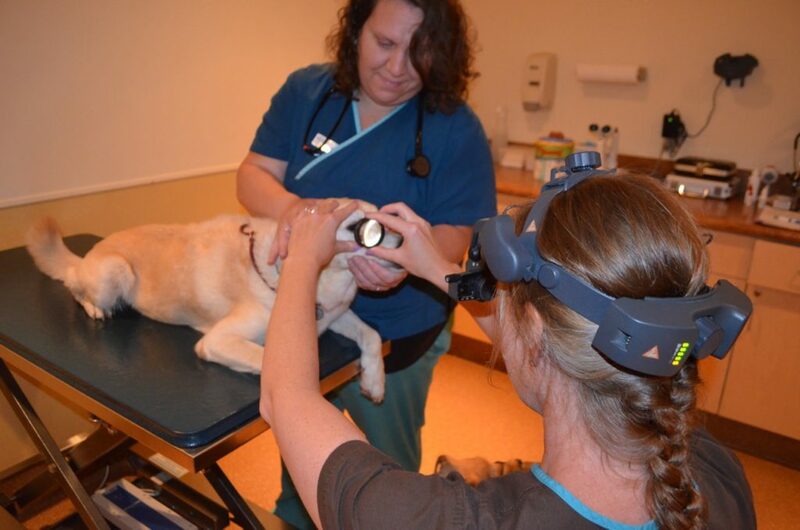 Sarah did a thorough examination, including using a slit lamp (an ophthalmic microscope) to look into the back of her eye, which is what you see in the photo above. Her eye pressure was at the high end of normal, which indicates she may be going into early secondary glaucoma, but that in itself did not rule out surgery to restore her vision. More on that in a minute. Then came the final and most determinant test, the electroretinogram or ERG. I had stepped away during that procedure because I had other dogs at the clinic and was in a different exam room, so I don’t have any photos, but her ERG results for that eye were great! So later that morning, Sarah told me we could definitely plan on surgery to restore Millie’s eyesight. There are two different things she will do in the course of the surgery. Sarah will?remove the luxated (or displaced) lens, which is cloudy from the cataracts, and replace it with a synthetic lens. This means suturing?it into place (can you imagine the hand-eye coordination for that?). 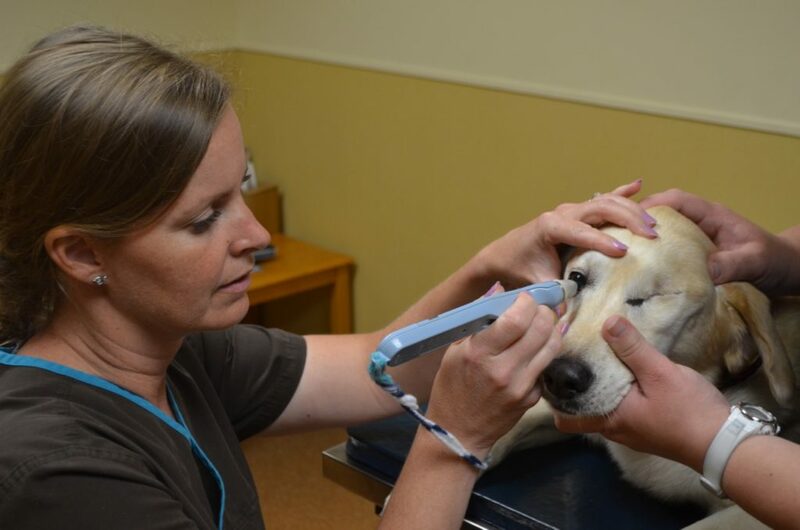 Because of Millie’s risk for glaucoma, Sarah will?also perform a complex procedure called endolaser cyclophotocoagulation, in which she uses a tiny endoscopic laser to destroy a part of the ciliary tissue that produces the aqueous humor (i.e., internal eye fluid). Since it is an excess of aqueous humor building up inside the eye that causes glaucoma, by reducing the production of the fluid, this procedure reduces the risk of Millie developing glaucoma later. This is as complicated as it sounds, and Millie will need to stay in the hospital for several days for close post-op monitoring by Sarah and her ophthalmology team. The surgery is scheduled for early September. If all goes well, Millie will come home with her vision restored, and she will be able to see for the first time in years! That’s wonderful news. We won’t cheer anymore until the operation is complete and she is back home and recuperating. She’s a lucky girl. Wow….such great news to start off a Monday! I absolutely love your organization and all you do for the animals in your care. I cannot imagine what your vets bills are….we are so proud to support your work financially. I know it’s not much but hopefully every little bit helps. That’s great news! Millie seems to be behaving very well during all these tests, what a good girl! Such wonderful news for/about Millie. It will be so exciting once she can see again! My dachshund, Dieter, had the lens in his left eye removed after it detached. The surgery required an incision around half of the iris, the removal of the lens, and microscopic stitches to close. He wore a cone for 5 weeks, but healed beautifully. (He hated the cone and deliberately rammed my legs with it, leaving bruises. Tell me how you really feel!!) He is now far-sighted in that eye, but has had no problems since the surgery. So happy for this little girl. It brought tears to my eyes reading this exciting news! Millie- you are undoubtedly in the very best loving care now who will never give up on you.The possibilities are so amazing! Steve, thanks so much for sharing these stories sounding so expert in the field now! 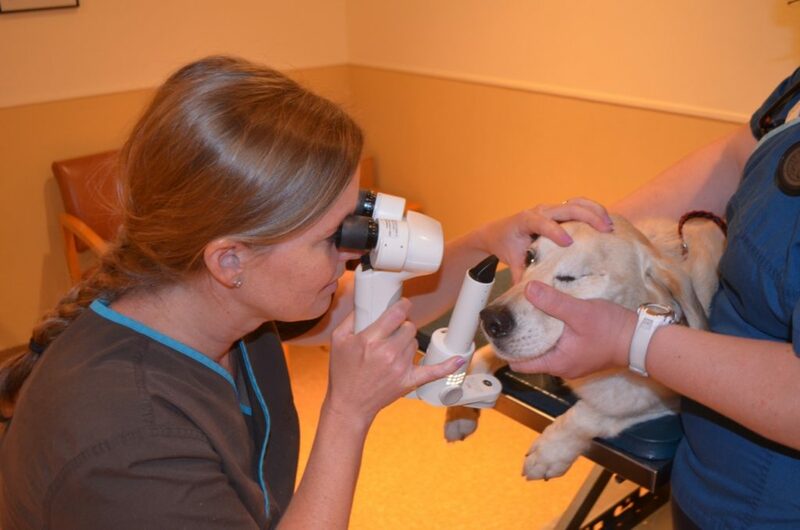 I would have never suspected there were so much we can do to help our dogs eyes. Good luck! So glad for you and Millie!